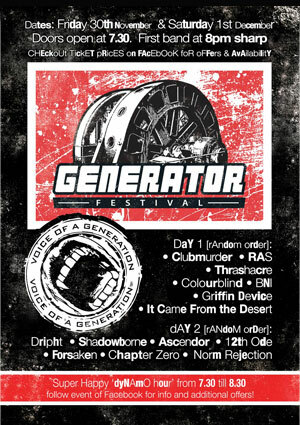 V-Gen Rock Club, Alternative Obsessions and Reciprocal Records have teamed up to hold the first edition of the “Generator Festival”. On the lines of the past “Broadband Gathering” festivals, the aim is to mix, blend and fuse various styles of music from Malta’s local talent. This is going to be one hell of an event, with 14 local bands to perform over 2 days on Friday 30th November and Saturday 1st December at V-Gen.